“The Songs The Season Brings” is a collection of classic and original Christmas songs to help celebrate the holiday season! This new EP from Beta Radio was made in various environments over the two months before Christmas - recorded in the studio, at home in bedrooms, and in closets of family members while drinking egg nog and roasting chestnuts over a George Foreman grill! We hope these songs will keep you company this Christmas as you're hanging ornaments, calling relatives, strategizing over where best to place mistletoe for that holiday smooch, paying bills, changing diapers, laughing, buying gifts, crying, eating candy bars and everything else the season may bring. Ho! Ho! Ho! released 29 November 2011 BENJAMIN MABRY sings, plays the guitar, glockenspiel and sleigh bells on this recording. BRENT HOLLOMAN plays the guitar, banjo, church bells and sings. AMANDA HOLLOMAN sings. THEO MILOJEVICH plays drums. ED SUMPTER plays the double bass. MAURA KROPKE plays the violin. ANNA GRIFFITH plays her trumpet. ANDY STANFILL plays his euphonium. Many, many thanks to A LOT OF PEOPLE for helping us sing, hoot and hollar on Song 3. All songs produced by BETA RADIO. They were recorded in our homes and were all written a really long time ago - except for song 2, which was written in the fall of 2011. Drums recorded at Logan Manor Studio by LEE HESTER. Songs 1, 2 and 3 were mastered by DAN COUTANT at Sun Room Audio. Song 4 wasn't mastered at all because it was recorded on a whim, the night before this album's thanksgiving release, in a closet, on 5 mobile phones (so naturally there wasn't any time for that). This album is only available as a digital download. Find this album at one of these fine distributors. DOWNLOAD OUR NEW CHRISTMAS EP FOR FREE - RIGHT NOW! We hope this letter finds everyone well, and those of you here in the states, full of holiday turkey, pecan pie and BBQ spare ribs. We've got some big news happening today that we want to share with everyone! As you might have heard, over the past few days and weeks, we've been hard at work on our newest recording. It's a collection of classic and original Christmas songs to help celebrate the holiday season! This new EP, “The Songs The Season Brings” was made in various environments over the past two months – we recorded in the studio, at home in bedrooms, and in closets of family members, while drinking egg nog and roasting chestnuts over a George Foreman grill. We are especially excited about this record! During this season of joy, peace and giving – we want to give something to you, totally free. This record is our gift to you, and we hope you enjoy listening as much as we enjoyed making it. From now until December 31st, you can get an immediate download by clicking below to go to our Bandcamp partner site. Choose Free Download and instantly get the songs and the artwork! *Don't forget, this expires on Dec. 31st so get it now while its free! - and if you like it, help spread the word through facebook, twitter, smoke signlals, word of mouth, etc. Tell a friend to download their own copy too! THE SONGS THE SEASON BRINGS - OUT TOMORROW! Over the past few days/weeks we've written about a collection of Christmas songs we're recording to help celebrate this holiday season... We've been hard at work and are excited to share them with you tomorrow! It's something to help keep you company while hanging ornaments, calling relatives, strategizing over where best to hang mistletoe, paying bills, changing diapers, laughing, buying gifts, crying and everything else you might do over the next month! As you can see in the attached photo, recording these songs has been a really great experience for Ben - he loves this time of year and has been listening to yuletide jams and looking forward to sweater parties and reindeer headbands since mid July! It however has been a really interesting experience for Brent - because he is a Grinch and a Scrooge and doesn't like winter or egg nog or Christmas music or Santa Claus or anything fun! Oh Humbug! - In all seriousness, we're incredibly thankful this year for you and your interest in our music. We hope for all those who celebrate, today was a blessed and joyful thanksgiving, and we are very excited for tomorrow! Vinyl test presses are here! 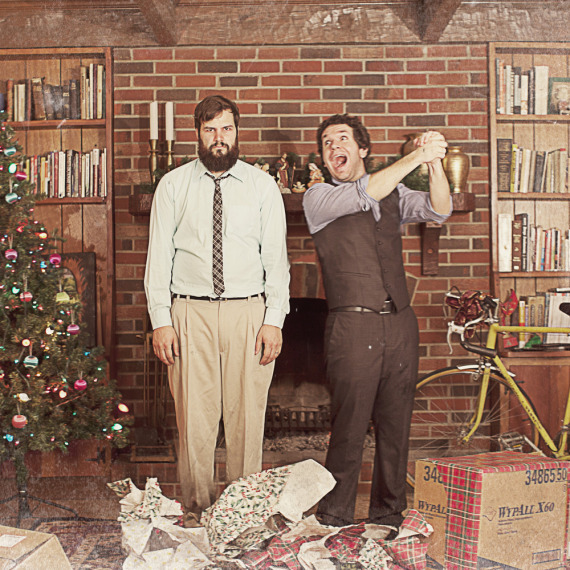 Pre-Order Seven Sisters Deluxe right here http://bit.ly/uTdnF3 and give the gift of analog this year! Joy! Yuletide! Mistletoe! We've been working really hard over the past month on some new Christmas music, and we're really excited to share it with you. Here we are in Ben's grandparents home recording a few trumpet and euphonium parts with our friends Andy and Anna. Look for the new EP "The Songs The Season Brings" after Thanksgiving! Seven Sisters (Deluxe Edition), is a limited, 500 copy run of our debut album Seven Sisters - on vinyl! Its something for all you audiophiles and analog lovers out there, and is now available to be ordered and shipped right to you! The reason why this record is a “Deluxe Edition,” is because in addition to the original eleven songs from Seven Sisters, it includes two unreleased tracks recorded after the original "Sisters" recording sessions. These new jams were written for the first two episodes of the CW Network's television series, Hart Of Dixie. All the songs have been remastered, and each record comes with reworked album art specifically for the vinyl release, as well as lyric sheets, liner notes, and a full album download code, so you can listen to these songs even when you're not near your turntable! Not a fan of Vinyl? Is analog to antiquated? Then get an immediate digital download of Seven Sisters (Deluxe Edition) from one of the fine digital distributors below! *This album is only available on vinyl and online distribution. Download this album at one of these fine digital distributors. Buy the vinyl at our store below. The new online store is now up right here, you can buy shirts, cds and pre-order our newest vinyl release: Seven Sisters (Deluxe Edition) Vinyl is a 500 record, limited run of the debut album Seven Sisters. It includes two unreleased tracks recorded after the original "Sisters" recording sessions, all songs have been remastered for vinyl. Each record comes with reworked album art specifically for the vinyl release, lyric sheets, liner notes, and album download code so you can listen to these songs when not near your turntable. *Special Note: PRE-ORDERS begin now but album will not be shipped until early December 2011, just in time for Christmas, Hanukkah and Kwanza. Also, just in time for New Years Day 2012 and Groundhogs Day. Up late tonight, grabbing some brain food while making some final preparations for the release of "Seven Sisters - Deluxe Edition" for next week. We are hoping for a September 20th digital release on iTunes and Bandcamp, and a mid November release of the deluxe vinyl record. Also, look for an online store by the 26th that will sell CDs, shirts and vinyl preorders! P.S. Pancakes. Here's a sneek peek at the cover of the limited Deluxe Edition of our debut record Seven Sisters. We're having 500 vinyl records pressed with all the original songs from Seven Sisters, plus two brand new tracks, reworked album art, and each copy comes with an MP3 download of all 13 tracks. The deluxe album will also be available on all online digital retailers by mid Sept. Stay tuned! We've been spending some time recently in our friend Lee Hester's studio, working on some new jams. This is our drummer Theo recording his part of the song. 2ND SONG FOR WARNER BROS. Here we are in the home studio recording a 2nd song for the CW tv show "Hart of Dixie." Look out for the pilot episode on Sept. 26th, which will feature us playing our song "The Man Grows" and also again on October 3rd for the second episode to hear this new tune! For those who don't know, we live and work in Wilmington, NC, which is also home to the once-again-burgeoning film community, due to some sweet tax incentives that went into effect this year. "Hart Of Dixie" is one of the shows that shot its pilot here, and Brent and I were asked to write and record a new song for it. We spent a few days and demoed some ideas for it, sent it to the producers and got an okay on the song. Look out for the tune in September, more info to come! The show stars Rachel Bilson and Jaime King. Here we are with Jaime King below. A few new shows with Tyler Ramsey of Band of Horses and Rusted Root, check out the shows page. Thanks everyone SOOOOOOOOOOOOOO much for coming out last night and hanging out with us! Thanks to Rio Bravo and Onward, Soldiers for playing with us... The place was packed out, we had a great time! Hopefully soon, we can do it again. Oh and also, our blond dutch giant friend Mike made us some sweet T shirts for the show, and my farmers almanac says that this is going to be a cold winter, so if you need something to cover your back and keep you warm, then we've got a few available. Or you might just want to go to JC Penny's and get something a little warmer, like a coat. Ben Mabry’s smile takes up his entire face, a face that is often likened to Steve Martin’s. As the singer for Wilmington band Beta Radio, which is having an album release show at the Soapbox on Friday, it’s easy to view Mabry as the polar opposite of the duo’s other half, Brent Holloman. Holloman is stoic, bearded and wears a tattooed ring in lieu of a wedding band while Mabry is energetic and loquacious, perfectly juxtaposed to Holloman’s fatherly reserve. Sitting together they interact like family, brothers who finish each other’s sentences. They’ve known each another for years, first meeting at summer camp. Three years later they began to write music together. During high school they played acoustic music when Mabry wasn’t playing in a metal band. Mabry attended Appalachian State, Holloman went to the Savannah School of Design. When Mabry was home they wrote songs, only to discard them. The fractured periods together led to sporadic writing coupled with varied music styles. “Each time we always found something new because we never wanted to look back at the old stuff,” Holloman said. Five years ago they started writing songs they refer to as “OK” but last year, after playing music off and on for a decade, they found their sound. Holloman’s sister owns a photography business and he and his wife helped on a wedding shoot in Ireland. While exploring, Holloman bought a banjo that would become a large part of the album’s texture. For two weeks last fall they had access to good recording equipment, which meant making quick decisions and sticking to them. By December they had seven songs, and later, another four at Holloman’s house with borrowed equipment. “Seven Sisters” is largely folk and acoustic driven and it’s peppered with gospel, string playing and introspective lyrics. The songs sound like they’ve been written by musicians who’ve been making albums for years. Friends, in the interest of shameless self promotion, here is a compiled list of the top 5 reasons to come see Beta Radio this friday: 1. Because we are playing with some super sweet bands who sound great and look even better. 2. Because we’ll be playing new songs and stuff from the album that you’ve never heard live before... with new additional arrangements on a few songs!!! 3. Because this show will feature not only our usual line up of guitars, vocals, banjo, drums and bass, but a few members of the Wilmington Philharmonic as well!!! 4. Okay, so there’s no such thing as a “Wilmington Philharmonic Orchestra” but if there was then the violin and horn players accompanying us on friday would certainly be members. 5. And finally because this is probably the last show for a while. You see, Brent has a bunch of weddings to shoot in October, and I will be spending the next few weeks preparing my bid for president in 2012 and writing my memoir. Also, i’ll probably have to cut the grass sometime then too. Here is the new Beta Radio release show poster for the 17th. Its one of three different colored prints made by Doc Reed. Who in fact, despite how it sounds, does not actually have a PhD. And if you like it, it'll be available at the show. SEPTEMBER 17TH ALBUM RELEASE SHOW!!!!!!!!!!!!! 1. New super sweet tee shirts printed on American Apparel and designed by our friend Stef Grinder!!! 2. Some posters printed on some super sweet paper pressed and made from trees, grown on planet earth and designed by our pal Doc Reed. So again. September 17th, Soapbox in Wilmington, Doors open at 9, $5 to get in. The online media journal BabySue.com reviewed Seven Sisters recently. They gave the record 5 stars!... or the equivalent there in. Check it out. 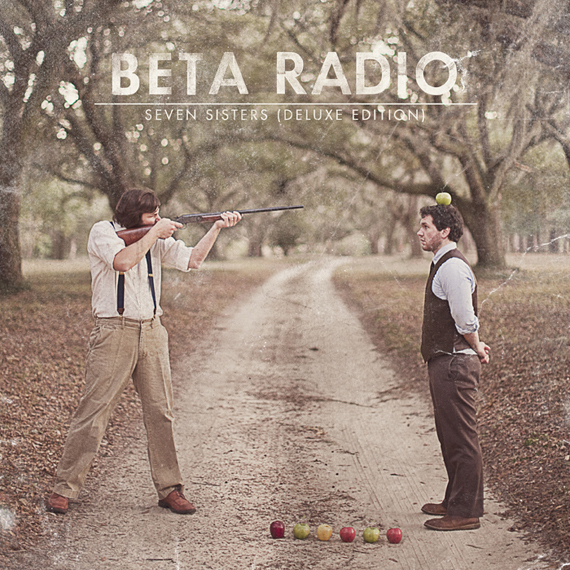 Beta Radio is the Wilmington, North Carolina-based duo comprised of Ben Mabry and Brent Holloman. These guys' package first caught our attention because of the interesting photos on the sleeve that show Holloman holding a rifle, preparing to shoot an apple (or maybe seven even) off the top of Mabry's head. Because of these images we initially thought the music on Seven Sisters might be comedy...but we were wrong. Ben and Brent write and record music that is instantaneously real and effective. Unlike many modern recording artists who rely on technology to cover up shortcomings, these fellows craft their music with plenty of tender loving care and acute attention to detail. The songs are recorded using traditional instruments...and the main focus is on vocal melodies and lyrics. available domains . Super smart songs here delivered straight from the heart. And the more you hear them...the better they sound. These guys pretty much hit the target with every single track...but our initial favorites include "Either Way," "Hello Lovely," "Highlight On The Hill" (a truly exceptional track), and "Return To Darden Road." Top pick.